The one and only software to convert all the Notes contacts to Outlook PST file. It is the single software which is used to convert names.nsf file nothing more than it. If any user wants software which can converts Notes Address book only then use this Notes Address Book Converter which scans your contact file, export all the data into single process and save that data applying alphabetic sorting. This software is an effective Lotus Notes conversion tool to convert Notes address book in batch system. It effectively converts Lotus Notes 'names.nsf' into PST, Excel or vCard file formats correspondingly.This is versatile NSF contact conversion software which converts Notes contacts in batch; and before converting, it scans the names.nsf file all contact and after conversion it also apply alphabetic sorting on them and save them in PST having all Meta information. 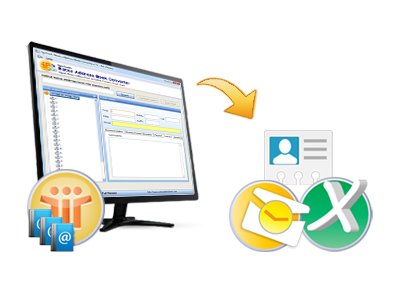 Software migrate Notes user contact file in Outlook PST, MS Excel and also in vCard Format. Users have to choose only file format during conversion process. This tool automatically scans whole names.nsf file after selecting the .nsf file for migration. When the scanning process is completed user can take a preview of names.nsf file user info details. Our Software not only scans the contacts of .nsf file but also lists them alphabetically and set them after applying alphabetic sorting. This utility easily export all the Address saved by user in names.nsf file and save them in the file format selected by user. It may be of PST, Excel or vCard file format. This utility can create ANSI/UNICODE PST file for Lotus Notes NAMES.NSF file during conversion process. But by default user get UNICODE PST file. User can give any desired location to save the converted names.nsf details on the system. It is done after Scanning of contacts during conversion process. Can I convert more than one names.nsf files together? No, User can only convert only single address book(names.nsf) at a time. For second file he/she should run whole conversion process again. Does the software runable on any version of Windows Operating system? Yes, this software supports all the versions of Windows Operating system including Windows 8.1 edition. What is the format of resulted PST file after conversion? As our software will convert Lotus Notes Address Book in Outlook PST file in UNICODE format by default. But user can select the format of PST file during conversion process.